Together, we can be a blessing! After drugs destroyed his past, Philip went out and made some new friends that might surprise you. 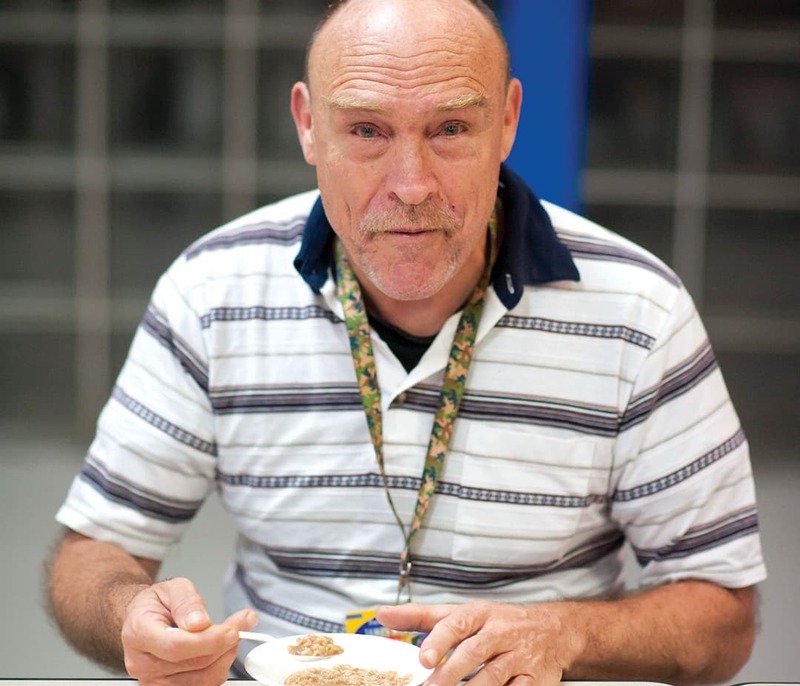 In Philip’s case, his “rock-bottom moment” prompted him to seek the help that he thought he would never need — before his life got any darker. 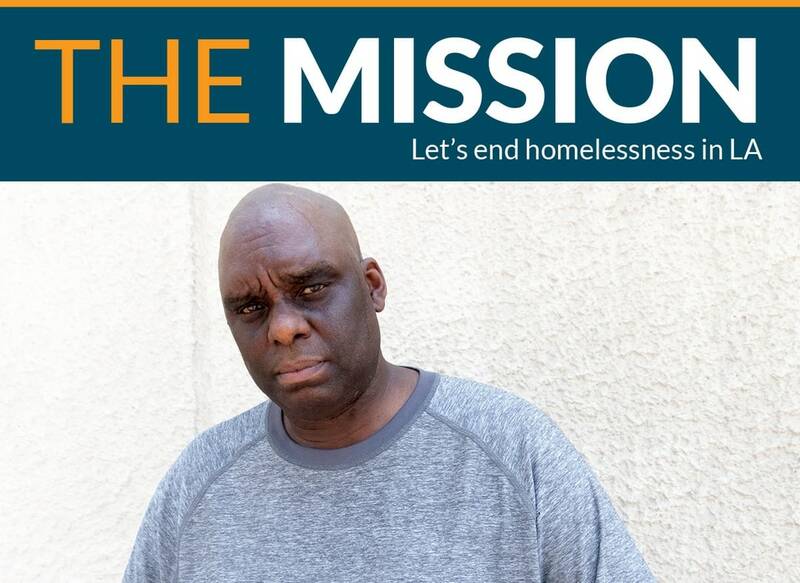 Philip came to Union Rescue Mission hoping we could help him get sober — and stay sober — in ways other programs couldn’t. 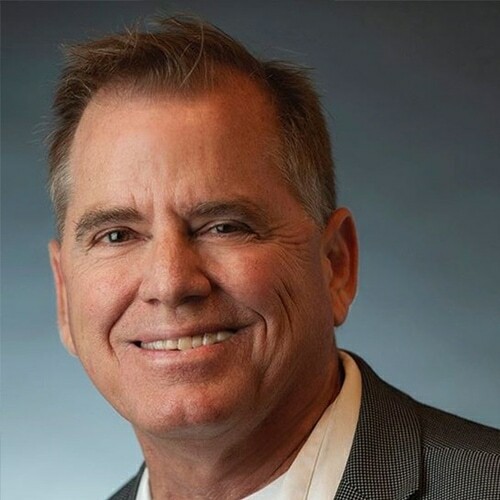 Not only did he find long-term sobriety here, but he’s working to make a difference in his old neighborhood with others who used to be rivals in different gangs. Philip has grown in other ways, too, since coming to URM. He’s also grown close to other men at the Mission whom he considers “my brothers” after all the advice they’ve given him. Then there is his newest group of friends: the families who come to the Mission for something to eat. As a chef in URM’s kitchen, he loves feeding the children. What really lifts his spirits, though, is encouraging moms and dads, especially those who feel like they’ve failed their kids. Going into Thanksgiving, he’s an entirely new person. “Overall, I’m just happy,” he says. “I’m thankful the Mission has helped me experience renewal.” He’s especially grateful for donors who give to see lives changed. “I just want them to know it’s working,” he adds. Your gift will make transformation possible for more precious souls this Thanksgiving. Will you give today? This Thanksgiving, hundreds of people will come to Union Rescue Mission for a delicious meal of turkey and all the trimmings! The food and volunteers come together to make the day joyful and festive. 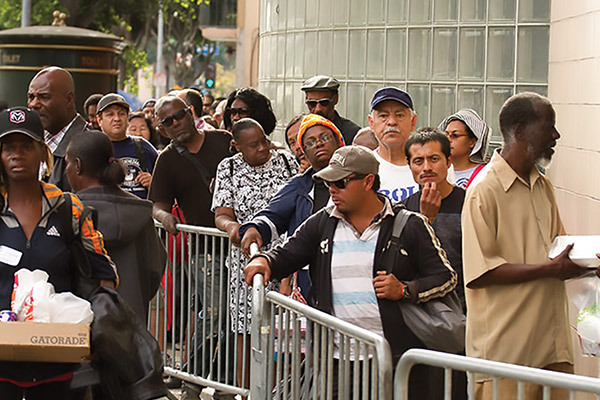 It’s just an amazing day of serving neighbors on Skid Row with a meal and the love of God — all thanks to YOU! Thanks to the generosity of good people like you, we will cook up to 500 turkeys the day before our big holiday meal. That’s enough food to bless all of our neighbors this Thanksgiving. 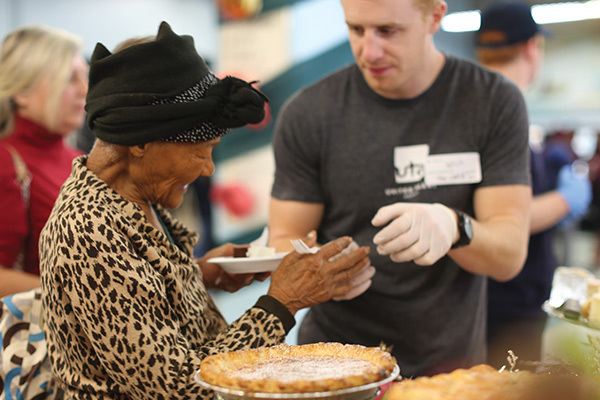 The crowds of hungry people who gather at Union Rescue Mission for our Thanksgiving celebration get more than a meal: they get to hear the Gospel and experience the love of Christ, thanks to the kindness of people like you who make it possible. 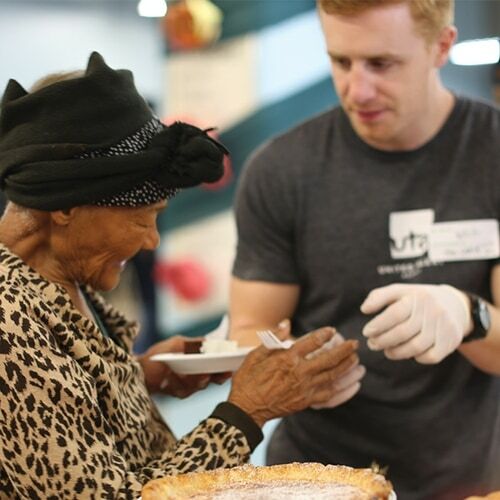 When you volunteer, you make Thanksgiving extra special at Union Rescue Mission. After helping to prepare the meal, our volunteers greet and serve those coming off the streets, offering love and compassion to all. Give someone the opportunity to experience new life this holiday season, starting with a meal. Just $2.54. SAT., NOV. 10, Thanksgiving Outreach Community invited to join us for our annual Thanksgiving meal Nov. 17. 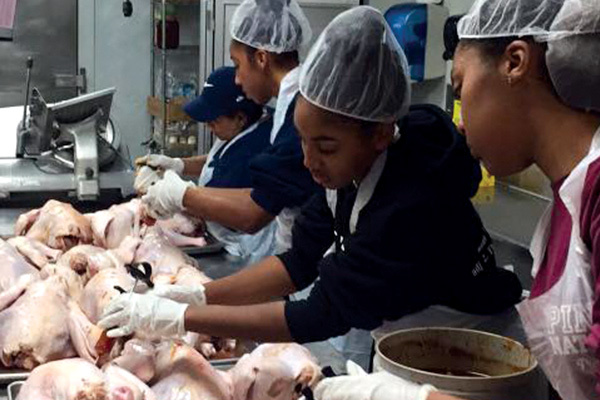 FRI., NOV. 16, TURKEY FRY DAY Volunteers and staff work in shifts, frying up 500 turkeys. SAT., NOV. 17, THANKSGIVING EVENT More than 3,000 meals will be served to our guests and community. 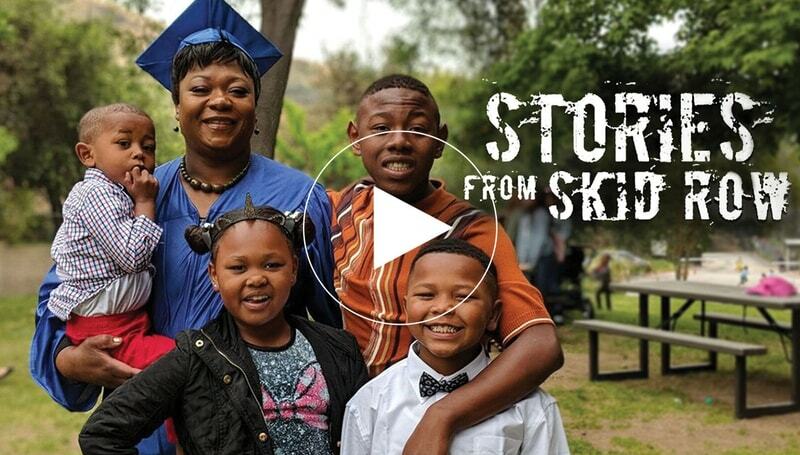 Watch Angela’s video to see how your gift transformed her life. This Thanksgiving, every gift of $2.54 provides a meal. PLUS it gives hope that can start someone down the path to new life. 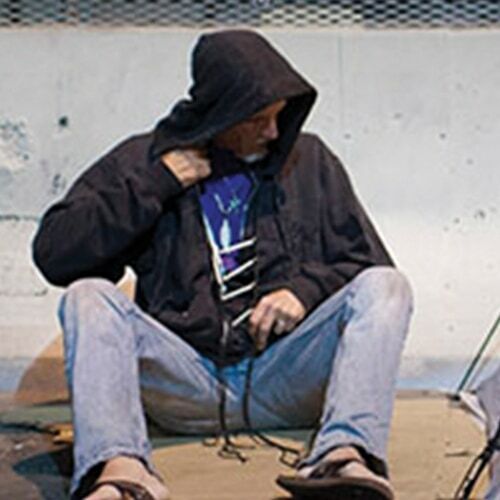 If you have blessed this past year, be a blessing to someone coming off Skid Row and give a generous gift today. 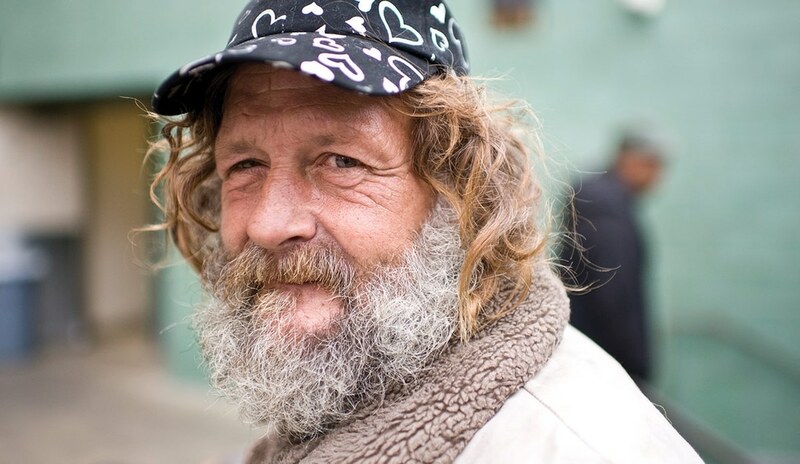 You’ll not only help provide a meal, you might help someone break an addiction, heal from trauma, or find the support they’ve needed to get off the streets for good. Thank you for your support! A meal can be the very start of hope for a hurting person! Please give more meals for $2.54 each today. This year, Nov. 22 isn’t just another Thursday. This is a time for people coming off Skid Row to lay aside their differences and come together and rejoice in the goodness of God, and the blessings that result from Him first loving us. This is the time to come together and rejoice in the goodness of God. I know that many people who step foot inside the Mission on this day will thank God for the good food that’s been prepared especially for them. But this Thanksgiving, I’d like them to look beyond the meal. To celebrate families coming together, new relationships being forged, and even old enemies becoming new friends. 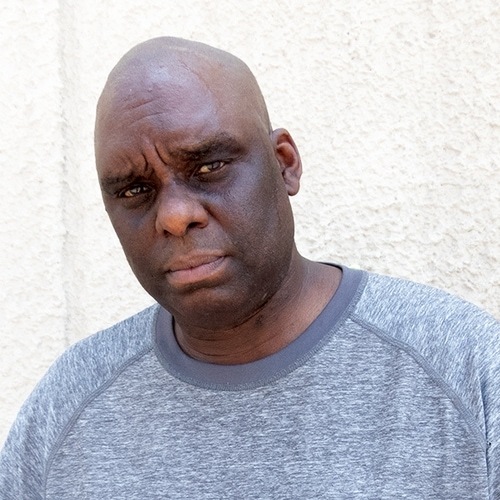 After all, if Philip (featured in this month’s newsletter) can witness peace between rival gang members from his old neighborhood in Compton, surely there’s hope for those who have been estranged from parents, children, and former spouses. This Thanksgiving, love and unity are making our holiday meal that much sweeter. Thank you for loving our less-fortunate neighbors the way Jesus loves them. May Christ’s love fill your heart with gladness.